FROM: THE DESK OF THE VICE PRESIDENT INTERNATIONAL PROMOTIONS/PRIZE AWARDS DEPARTMENT AUSTRALIAN INTERNATIONAL SWEEP STAKE LOTTERY CORPORATION 2009. 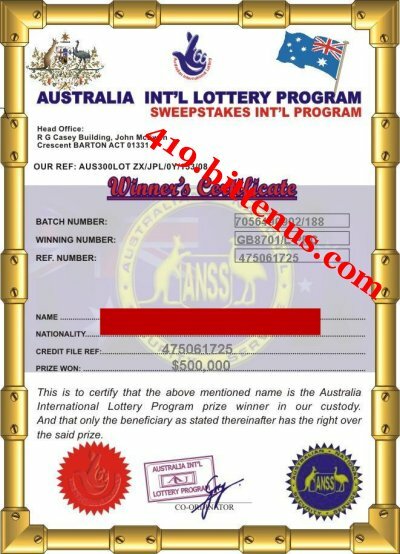 We are delighted to inform you that you have won the sum of $500,000.00 from Australian Lottery Awards Programme. AUSTRALIAN! collects all the email addresses of the people that are active online, among the millions that subscribed to Yahoo and Hotmail and few from other e-mail providers. Six people are selected monthly to benefit from this promotion and you are one of the Selected Winners.To file for your claim, please contact our director of finance. confidential from the public until Your claim is processed and your prize released to You. E-mail:( j21.hupas@yahoo.com) quote the amount won and mobile phone number while sending your winning details to your claims agent.